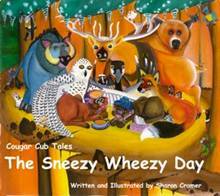 "Just in time for the peak of cold and flu season comes The Sneezy Wheezy Day (January 2012), a children’s picture book every parent will want to keep on hand for when the sniffles come on! As a nurse and mother of three, Sharon Cramer has seen more than her share of winter illnesses. So much so, she was inspired to write The Sneezy Wheezy Day, the third in the award-winning children’s series that follows the adventures of a brother and sister cougar cub. In The Sneezy Wheezy Day, brother cub has a cold, so he and his sister seek help from their friends to make him better. As he and sister cub seek help for his cold, they encounter many well-intentioned forest friends who offer silly home remedies. One friend even tells brother cub, “Tickle your nose with the tail of a goose and do it before the next blue moon rise!” Although the recommendations help, the final remedy is a sibling’s love." What we thought: The Sneezy Wheezy Day is a beautifully illustrated story that all kiddos will be able to relate to. It is a great book to brighten up the spirits of a sick little one. We really enjoyed sharing this cute book with A and D and they request it quite often. 5 year old A said she really enjoyed the funny remedies the animal friends offered and 3 year old D loved the gorgeous and colorful illustrations. The Sneezy Wheezy Day is perfect for the cold and flu season, but I'm pretty sure we'll be enjoying it year round:) ABCD Diaries gives The Sneezy Wheezy Day an A+! Thank you so much for the very thoughtful review. Your small ones are adorable and very clever with ABCD! LOVE your site! It is so nice when a reviewer gives an author/artist a sincere write up. You are so genuinely appreciated, and most of all, I LOVE that A and D like the book! Make my day!